This year at the Taste of Chicago, Humana is offering healthier options and I have teamed up with them to give away tickets to the Taste of Chicago! 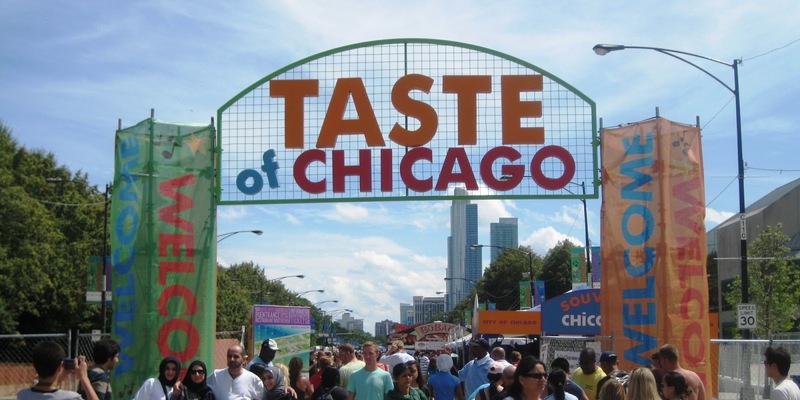 If you and your loved ones are looking for the lighter side of food at taste of Chicago, Humana is making it easy! Just look for the little green apple indicators next to the food items on participating booths. an activity at the Humana Walk & Wellness Station in the Humana Well-being Experience on Columbus Drive. Earn six stamps to be entered for a chance to win prizes. Drop off your completed rewards tag at the Humana Walk & Wellness Station. Prize drawings will be held Sunday, July 12, starting at 8:45 p.m. at the Humana tent. at participating Humana Healthier Choices restaurants. Here are options for our gluten-sensitive consumers, although they may not meet the Humana Healthier Choices criteria listed above. Humana will host a healthy food cook-off between Chicago Bears Alum Tom Thayer and WXRT Mary Dixon at 12:30pm CT on Saturday, July 11. The cook-off will also feature special guest judges such as Chicago Bear Alum Tom Waddle and DJ Johnny Mars. To enter to win Taste of Chicago tickets, email info@agirlandherfood.com and winner will be announced tomorrow at noon on my Twitter and Facebook! “The information and Taste tickets have been provided by Humana so that I could try Humana’s Healthier Choices and share my thoughts and information about Humana’s Healthier Choices. The opinions expressed in this post are my own and do not reflect the opinions of Humana."